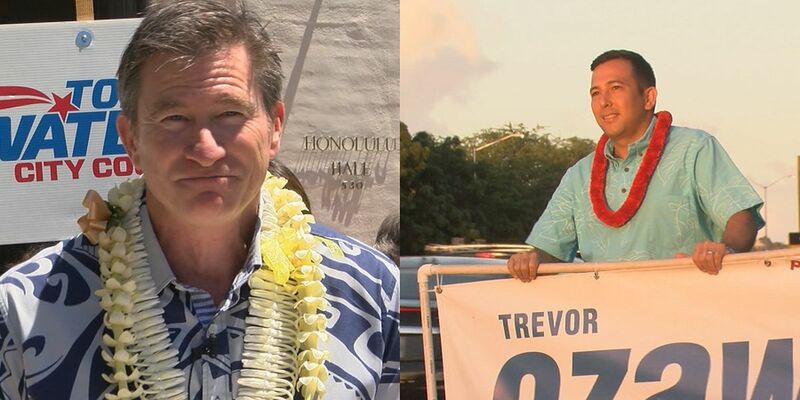 HONOLULU (HawaiiNewsNow) - There are just two days left to vote in the City Council special election showdown between Trevor Ozawa and Tommy Waters. Walk-in polling at Honolulu Hale continues through Friday ― from 8 a.m. til 4 p.m.
On Saturday, the final day to cast a ballot, the polls will be open from 7 a.m. to 6 p.m.
That 6 p.m. deadline is crucial. The City Clerk’s Office is stressing that mailed ballots must be received by 6 p.m. Saturday, too. Voters also may drop off their completed, mail-in ballot envelopes at Honolulu Hale before 6 p.m.
Why the focus on the 6 p.m. deadline? Because it was the city’s failure to comply with it in November that prompted the state Supreme Court to side with Waters in a challenge to Ozawa’s narrow win. The special election, which is costing the city $250,000, is for the District 4 seat that runs from Hawaii Kai to Ala Moana Park. All 65,000-plus registered voters in the East Honolulu district were mailed ballots the last week of March. But walk-in polling is also allowed, and a few hundred have already opted to do that.